In the past few years, the field of metagenomics has been growing at an accelerated pace, particularly in response to advancements in new sequencing technologies. The large volume of sequence data from novel organisms generated by metagenomic projects has triggered the development of specialized databases and tools focused on particular groups of organisms or data types. Here we describe a pipeline for the functional annotation of viral metagenomic sequence data. The Viral MetaGenome Annotation Pipeline (VMGAP) pipeline takes advantage of a number of specialized databases, such as collections of mobile genetic elements and environmental metagenomes to improve the classification and functional prediction of viral gene products. The pipeline assigns a functional term to each predicted protein sequence following a suite of comprehensive analyses whose results are ranked according to a priority rules hierarchy. Additional annotation is provided in the form of enzyme commission (EC) numbers, GO/MeGO terms and Hidden Markov Models together with supporting evidence. Viruses are the most abundant biological agents and comprise the majority of the biodiversity on Earth [1–3]. However, understanding the population biology and dynamics of viral communities in the environment is difficult because their hosts (predominantly microbes) are unknown and cannot be grown in culture. Furthermore, the study of viral diversity is hampered by the lack of a universally conserved gene across all viral species, analogous to rDNA genes in cellular organisms. Metagenomic shotgun sequence analysis of viral communities helps to alleviate these constraints and is currently the most widely used approach to study the biodiversity of viral populations isolated directly from the environment. The recent development of faster and cheaper next generation sequencing technologies has contributed to an exponential growth of metagenomic sequencing data, transforming our view of the microbial world. Despite the advancements in sequencing technology, functional annotation of metagenomic sequences is still very challenging. Metagenomic data originate from heterogeneous microbial communities, are usually noisy and partial, and reads frequently contain truncated open reading frames (ORFs). Complicating this landscape, the vast majority of viruses isolated from environmental samples are novel and consequently most of their genes do not have homologous sequences in the public databases, making functional annotation even more difficult. Currently, there are a number of publicly available bioinformatics tools for the taxonomic (Ribosomal Database Project(RDP) , Greengenes , MEGAN , pplacer ) and functional (IMG/M , CAMERA , MG-RAST ) analysis of metagenomes. While IMG/M facilitates the functional analysis of pre-selected metagenomic data, it does not support the input and analysis of external user data. CAMERA allows for the construction of customized workflows for the analysis of external metagenomic data including functional annotation using RAMMCAP based on PFAM, TIGRFAM and COGs. MG-RAST is an alternative web-resource that performs metabolic reconstructions using SEED subsystems  and builds automated phylogenetic profiles of metagenomic data provided by the scientific community. While MG-RAST has been used for the functional annotation of multiple viral metagenomes , it is not ideal for the characterization of viral metagenomic data since functional classification is solely dependent on similarity to FIGfams , protein families developed from manually curated bacterial and archaeal proteins. Another limitation of this tool is that it does not search for conserved protein domains or motifs that could provide additional clues about the functional roles of genes present in metagenomic samples. Here we describe a viral metagenomic annotation pipeline (VMGAP) that is currently utilized at the J. Craig Venter Institute (JCVI) for the functional annotation of viral metagenomic datasets. This pipeline incorporates a number of HMM and PSSM searches and makes use of a suite of specialized databases to improve the functional identification of viral genes. Results can be imported into JCVI Metagenomic Reports (METAREP) , an open source tool for high performance comparative metagenomics that allows users to view, query, browse and compare extremely large annotated metagenomic data sets. The VMGAP requires a protein multi fasta file as input and the local installation of several open source programs, packages and public databases. The required software and packages are HMMER , NCBI-toolkit (blast searches ), SignalP (signal peptide prediction ) and TMHMM [19,20] and PRIAM (Ecnumber prediction ) . Among the public databases searched by the pipeline are GenBank NRDB, GenBank environmental databases ENV_NT and ENV_NR, UniProtDB , OMNIOMEDB , PFAM  and TIGRFAM  HMMDBs, ACLAME protein and HMMDBs , GenBank CDDDB  and pfam2gomappingsDB . 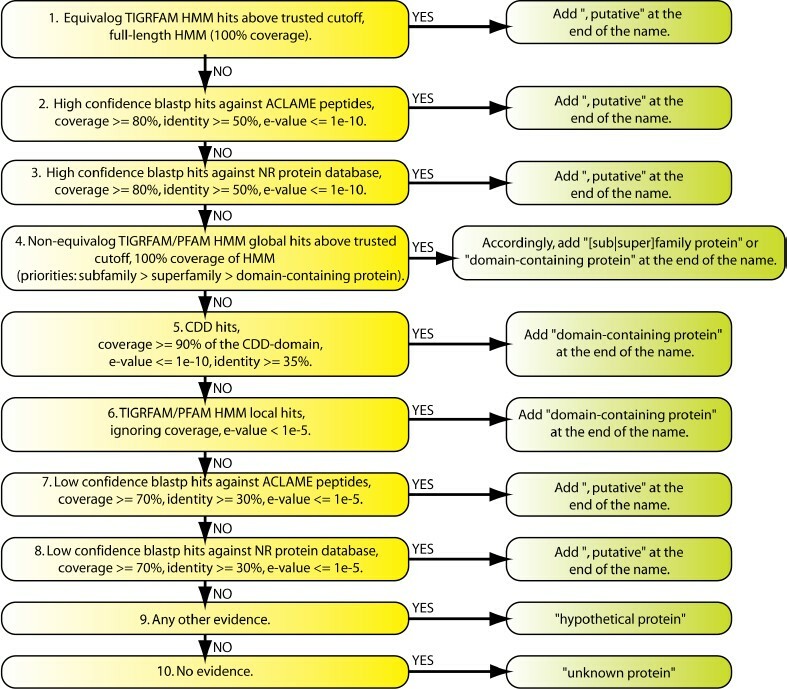 Naming rules used for functional annotation of the VMGAP. The non-redundant protein database encompasses several public protein databases (GenBank NR, UniProt, PIR and OMNIOME) where each set of redundant peptides are condensed into a single database entry without losing useful information recorded in the fasta headers, such as EC numbers, product names, and taxon identification number. The VMGAP reports the top 50 hits with e-values ≤1x10-5. ACLAME is a public protein database of mobile genetic elements (MGEs), including bacteriophages, transposons and plasmids . Proteins are organized into families based on their function and sequence similarity, and families of 4 or more members are manually annotated with functional assignments using GO and MeGO terms (an ontology dedicated to MGEs developed by ACLAME). All blastp hits with e-values ≤1x10-5 are reported. The VMGAP queries three different environmental composite databases at the amino acid level: (i) ENV_NR, a GenBank non-redundant protein database that includes many environmental datasets, (ii) an in-house database (SANGER_PEP) composed of proteins coded by Sanger-based viral metagenomic samples not represented in ENV_NR (Table 1), and (iii) ENV_NT, a collection of nucleotide sequences from metagenomic datasets deposited in GenBank. The purpose of these analyses is to determine how similar the viruses are within the query metagenomic samples to viruses and microbes that inhabit the different environments represented in the subject databases. The VMGAP reports all blast hits with e-values ≤1x10-3. In addition to similarity searches against protein databases, the VMGAP looks for the presence of HMMs from two databases, PFAM/TIGRFAM (a database of HMMs representing conserved protein domains) and ACLAME-HMMs (a compilation of HMMs that describe each of the protein families found in ACLAME). PFAM/TIGRFAM HMM searches are carried out in two different ways, either requiring a global or local alignment to the HMMs. Local HMM alignments increase sensitivity in the detection of conserved protein domains, particularly when the predicted peptide is truncated and extends to the end of the read, which is noted frequently in metagenomic datasets. All HMM hit with e-values ≤l1x10-5 are recorded for further analysis. The NCBI Conserved Domain Database (CDD) database is a collection of position specific scoring matrices representing conserved protein domains, protein families and superfamilies compiled from NCBI-curated domains , PFAM/TIGRFAM, SMART  and COG . In spite of the overlap, PSSMs derived from PFAM/TIGRFAM do not behave exactly the same as their HMM counterparts, and in some cases these searches can identify domains where HMMs fail. The VMGAP stores all hits with e-values ≤ 1x10-5. To discover transmembrane proteins and signal peptides that could be associated with the surface of viral particles, the VMGAP utilizes two programs, SignalP for the identification of signal peptides, and TMHMM, a program that detects candidate transmembrane domains. To aid in the metabolic reconstruction of metagenomes, the VMGAP makes use of PRIAM, a collection of PSSMs where each matrix represents an enzymatic function and is assigned to a particular EC number. Metagenomic samples are scanned for the presence of these PSSMs with RPS-Blast recording only those hits with e-values ≤1x10-10. Functional assignments of predicted peptides are carried out by retrieving the functional information produced from the results of the analyses performed in the previous steps following a series of pre-defined rules (Figure 1). Rules prioritize the use of a certain piece of evidence over another based on how informative, trustful and accurate that evidence is. As shown in Figure 1, hits against equivalog TIGRFAM HMMs are the highest ranked supporting evidence for functional assignments in the VMGAP. Therefore, any protein that hits above the trusted cutoff of one entire copy (100% coverage with respect to the length of the HMM) of an equivalog TIGRFAM will automatically inherit the functional annotation associated to that particular HMM. The second and third tiers of evidence are constituted by highly significant BLASTP hits against ACLAME DB and the non-redundant protein database respectively; having at least 80% coverage (with respect to the shortest sequence), 50% identity and an e-value ≤ 1x10-10. Although proteins from ACLAME DB are also included in the non-redundant protein database, entries in the former have a higher priority since they are curated and therefore provide better functional annotation. Hits against HMMs describing ACLAME protein families and PFAM/non-equivalog TIGRFAM HMMs comprise the 4th and 5th layers of functional evidence, giving higher priority to those HMMs representing protein families against those describing conserved protein domains. Ranked 6th and 7th in the rule list are respectively RPS-BLAST hits with at least 90% coverage, percent identity ≥ 35% and e-value ≤ 1x10-10 against NCBI-CDD profiles and local-local hits against PFAM/TIGRFAM HMMs with e-values ≤ 1x10-5. Finally, low-confidence BLASTP hits with at least 70% coverage, percent identity ≥ 30% and e-value ≤ 1x10-5 against ACLAME DB and the non-redundant protein database occupy tiers 8 and 9 in the priority list respectively. Proteins that lack the evidence types described above, but still contain some other evidence such as hits against the environmental DBs are named “hypothetical protein”. Otherwise, proteins are labeled as “unknown protein”. 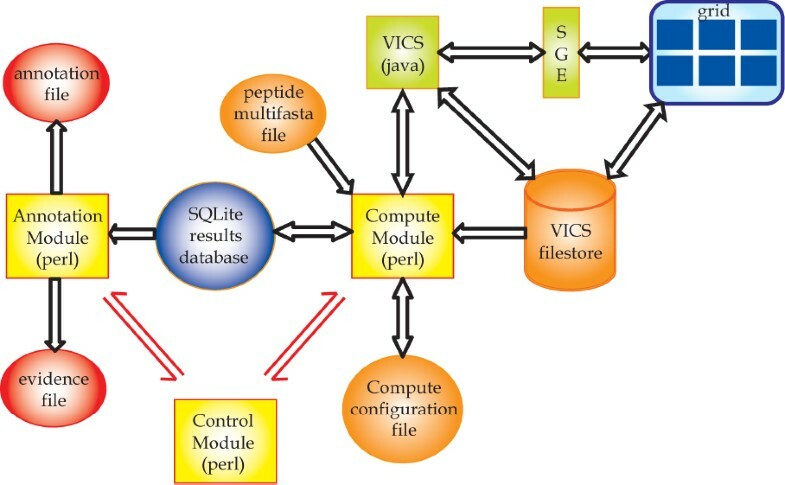 The VMGAP consists of three major modules implemented in Perl (Figure 2): (i) the control module, which initializes the pipeline, creates a sqlite DB  to store the status of computations and their results, coordinates the other modules, and allows interrupted pipelines to be resumed from the point of interruption, (ii) the compute module, which tracks the status of the individual computations and loads completed computations into the sqlite database, and (iii) the annotation module, which reads the computational results from the sqlite DB and applies a set of predefined rules to generate a tab-delimited annotation file containing the final annotation for each peptide (e.g. EC/GO assignments and protein names), and a tab-delimited evidence file that stores all the evidence that supports the annotation. Each line in the annotation file contains the functional annotation for an individual peptide, while in the evidence file each line represents one particular evidence for a single protein (Table 2 and Table 3). Additionally, the VMGAP contains an optional module, also implemented in Perl, called Com2GO (Common-Name-to-Go Mappings). Com2GO can be run after the annotation module to attempt to classify the protein names using the GO hierarchy. Schematic representation of the implementation of the VMGAP. The three main modules of the pipeline are depicted by yellow squares. Orange and red circles represent input and output files respectively. VICS stands for Venter Institute Compute Services; SGE stands for Sun Grid Engine job scheduler. Single and double-headed arrows indicate information flowing in one or both directions respectively. Fields 1 and 2 correspond to the protein identifier and a flag specific for each analysis, respectively. % cov, percent coverage; % ident, percent identity; CDD_RPS, RPS-Blast vs. CDD DB; ALLGROUP_PEP, Blastp vs. protein NR DB; ACLAME_PEP, Blastp vs. ACLAME protein DB; SANGER_PEP, Blastp vs. in-house viral metagenomic DB; ENV_NT, Tblastn vs. ENV_NT DB; ENV_NR, Blastp vs. ENV_NR DB; FRAG_HMM, HMM searches vs. local PFAM/TIGRFAM HMM DB; PFAM/TIGRFAM_HMM, HMM searches vs. global PFAM/TIGRFAM HMM DB; PRIAM, RPS-Blast vs. PRIAM profile DB; ACLAME_HMM, HMM searches vs. global ACLAME HMM DB; PEPSTATS, peptide statistics; TMHMM, transmembrane domain searches; SIGNALP, signal peptide searches. Each lane contains the annotation for a single predicted peptide. Multiple values within a field are separated by the symbol “∥”. The heart of the VMGAP is the compute module (Figure 2). This module accepts a compute configuration file (see Table 4 for the current configuration) and a sqlite results database. It compares the computations specified in the configuration with the results loaded into the sqlite results database. Missing computations are initiated, stale computations (outdated reference dataset or obsolete program options) are refreshed, and interrupted computations are resumed. The computations themselves are executed either in a local machine (for jobs that are not very computational intensive such as SignalP), or through the JCVI high-throughput computing platform named VICS web-services. VICS is a J2EE server backed by a 1600 node SGE-grid and a 2 Terabyte scratch-disk. All of the computations are started (or restarted) and then the compute module waits for them to complete. As a computation is completed, its results are parsed and loaded into the sqlite database and the status of the computation is updated. When all computations have completed, the module exits and allows the controller to proceed. The module may be interrupted manually and restarted at a later time. Small files can be easily imported and analyzed in Excel. For extremely large files (more than a million entries), we recommend users to import the data into METAREP  for further analysis and visualization. The METAREP tab-delimited import format specifies many common annotation data types including those computed by VMGAP. To import VMGAP annotations, we recommend the mapping outlined in (Table 5). To import the data, users have to install a local version of METAREP. The source code can be found at the METAPREP website . The code also contains a Perl based utility for importing METAREP tab-delimited files. Details about the installation and import process can be found in the METAREP manual which can be downloaded from the METAPREP dashboard . aJCVI non-redundant protein database; b, PFAM/TIGRFAM local-local alignment HMM database; c, data not available. In recent years and with the advancement of next generation sequencing platforms, metagenomic studies have become more affordable to the scientific community. This has triggered an exponential growth in the amount of metagenomic sequencing data available within public repositories and stresses the necessity for specialized highly efficient computational tools to cope with the functional annotation of these massive datasets. There are currently a variety of metagenomic annotation tools that are available to the general public through the web. Among the most popular resources is MG-RAST, an annotation tool that offers many advantages to the user: (i) it does not require a high-throughput computer facility, (ii) it uses reads instead of proteins as input and therefore there is no need for gene predictions, and (iii) the results are classified into functional categories facilitating the analysis of data. Perhaps most importantly, the functional distributions can be compared against other datasets that were annotated with MG-RAST. 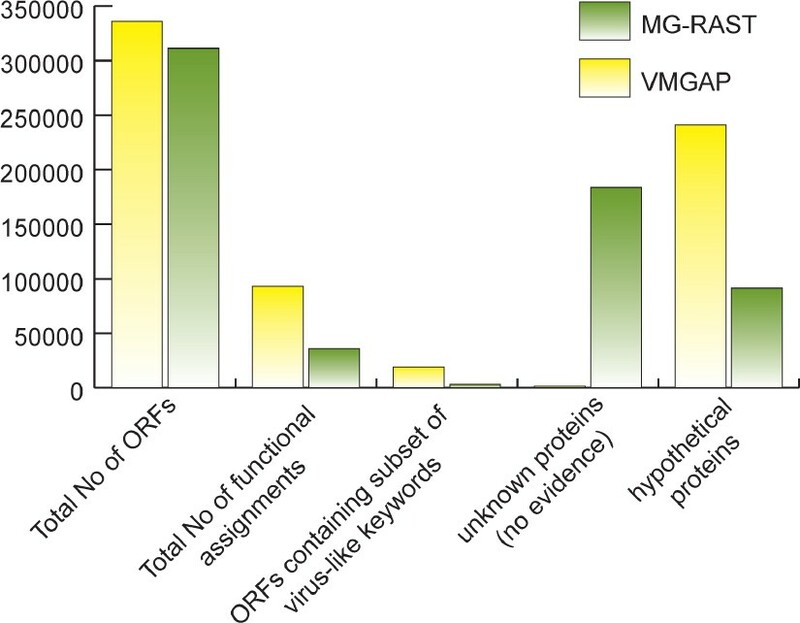 While MG-RAST is capable of providing meaningful taxonomic and functional annotation of microbial metagenomes, it is limited in its capacity to annotate viral metagenomes due to its inherent dependence of FIGfams. In order to quantitatively assess the utility of VMGAP for the functional annotation of viral metagenomic data, we ran an identical set of ∼300,000 peptide sequences from a marine viral metagenomic library or their respective coding ORFs through the VMGAP and MG-RAST respectively. Analysis of the results showed that the VMGAP could assign functions to almost 16% more sequences compared to MG-RAST (names other than hypothetical or unknown, Figure 3). More specifically, when looking for viral-like enzymatic functions (e.g. integrase, endonuclease, DNA polymerase) or names describing viral-like structural functions (e.g. capsid, tail, neck, envelope), the VMGAP assigned almost 16,000 more viral-like names compared to MG-RAST. Of the sequences that received no functional names, ∼72% contained some other evidence such as hits against environmental databases, PFAM domains or signal peptides while only 29% of such sequences are reported in MG-RAST (Figure 3). A more in-depth analysis showed that the increase in assigned VMGAP-associated functional terms was due to the incorporation of databases that contain viral-specific annotation, such as ACLAME. Since VMGAP also performs additional analyses such as HMM, CDD and environmental DB searches as well as MeGO/GO and EC number assignments, it provides a more comprehensive repertoire of evidence types that may facilitate the discovery of novel viral functions as well as comparative analyses of metagenomic datasets. exo) nuclease, phage, viral, capsid, envelope, filament, and basal plate. Regarding the VMGAP implementation, the generation and storage of results into a relational sqlite database presents many advantages over working with flat files. The sqlite database allows the pipeline to monitor the status of each process launched on the grid and, in case of failure, restart the pipeline from the point that it crashed. Also, it makes it easier to query results, integrate different data types when generating summary reports, and share this information since all the analysis data (i.e. programs, parameters, cutoffs) and their results are stored in a single sqlite file. The storage of data in an sqlite database, however, might present some loading speed challenges when the data volume is very large and the speed of the storage device where the database resides is not fast enough (e.g. 7,200 RPM SATA drives). At JCVI, sqlite databases typically reside in 15,000 RPM SAS drives, with bandwidths of ∼ 500 MB/sec. For slower systems, we recommend avoiding the usage of these databases and rather parse the results directly from the raw outputs of the analyses to generate the annotation and evidence files. The organizational format of the output tab-delimited files, annotation and evidence are also advantageous. Since the first column of these files contains unique protein identifiers, all of the annotation and supporting evidence for any protein or group of proteins can be retrieved using the Unix grep utility directly from the command line. These files can be also imported into Excel for their inspection and analysis. Lastly, the VMGAP pipeline can be easily updated and customized to meet the specific needs and objectives of the user through the addition of additional virus-specific databases as they become available or the inclusion of more specialized boutique databases (e.g. RNA virus specific datasets) respectively. This research was supported by the Office of Science (BER), U.S. Department of Energy, Cooperative Agreement No. De-FC02-02ER63453 and by the National Science Foundation Microbial Genome Sequencing Program (award number 0626826). We would like to thank Johannes Goll for his technical expertise on METAREP.